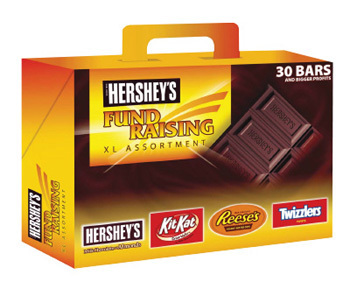 This Hershey’s™ XL Assortment Fundraising Kit includes four of the most popular candy bar flavors: Kit Kat, Reese’s Peanut Butter Cups, Hershey’s Milk Chocolate with Almonds, and Twizzlers. Your group sells each bar for $2.00 each and earns 30% to 45% profit depending on how many cases that you order. The price of each case is lower with the more cases you order. The minimum order is only 1 case! Each case has 4 carriers of 30 candy bars each. And, shipping is FREE! Plus, for every 6 cases you order, you’ll receive a giant 5 pound chocolate bar! Receive a free 5lb bar for every 6 cases ordered. BONUS! 5lb Chocolate Bar With Every 6 Cases Ordered! You’ll receive a free 5 pound chocolate bar with every 8 cases you order. 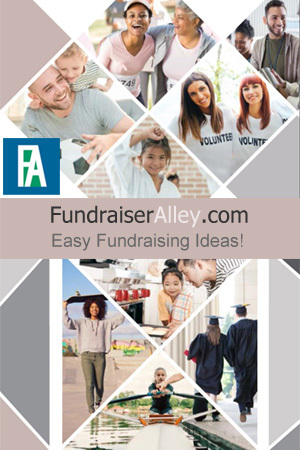 You can use this as an incentive prize to the highest seller. Or, raffle it off to earn more funds. 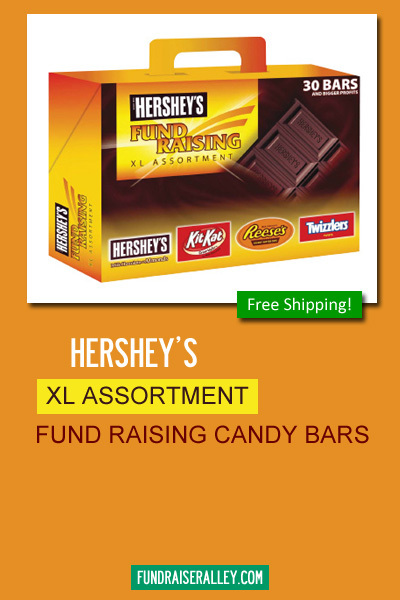 Candy Bars are a great fundraising idea for sports teams and school clubs. You can’t go wrong with these popular Hershey’s candy bars! Sell at school, games, and events. Keep your concession stand stocked and sell them during lunch break.